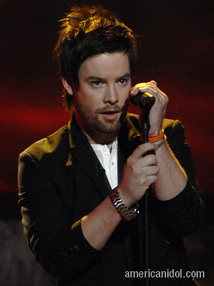 I want David Cook to win. There, I said it, I'm out there. David Archuleta is very sweet and he has a lovely voice (he reminds me of a baby Josh Groban) but David Cook is hot. He's Randy Jackson, "that's a hot one tonight!" kind of hot. He's what's current kind of hot. And he's just good old fashioned hot, hot. He's my new Blake Lewis. He won't win though. David Archuleta will win. And that's okay. Cook will have a fabulous career without the burden of the now infamous prison-like Idol winner contract and I predict that he'll eventually even give Chris Daughtry a run for his money when it comes to former Idol contestant record sales. The worst part of Tuesday night will be cringing as poor Cook has to sing whatever sappy power-ballad the Idol producers have chosen for the finale song this year. Remember poor Blake having to struggle through "This Is My Now" last spring? Ouch. Perspective - we all need a good dose of it every now and then. Just as our friend Tim has settled nicely onto the path towards a promising recovery, another bright light in the cycling world has been hit with the worst news that anyone can ever receive - his wife is dying. I've never met Elden Nelson (aka The Fat Cyclist), or his beautiful wife Susan, or any of their stunning four kids, but I have long been a huge fan of Elden's blog, his writing, and his infectious spirit. For ages now Elden has struck an incredible balance in writing, on one hand, some of the funniest pieces on cycling I've ever read and, on the other hand, some of the most touching and personal accounts of his wife's battle with cancer. Even though I have never met anyone in the Nelson family, I openly wept at my computer twice this week as I read his posts about finding that Susan's cancer has moved to her brain and that, according to their oncologist, they are now "out of options." Susan has only a few more months to live. As I mother, my first thought was of all the milestones in the lives of those four kids that Susan is going to miss. I thought about Elden and what the future will be like for him raising those kids on his own. I thought about my own kids, my own husband and my own health - I think it's impossible for any of us to hear a story like this without doing the same. There are literally hundreds of comments on Elden's blog offering thoughts and prayers from every corner of the world. The whole Nelson family is very loved. These are good, good people going through something that is truly unimaginable to someone who's never been there. These are strong, courageous people. These are people who deserve so much better. But these are also people who have taken their love and their courage and their spirit and created a huge, positive energy in the universe and no matter how long or short Susan's path may be, her spirit will be remembered for much longer, and will continue to impact and influence even those who - like me - never had the honor of meeting her. Many of you are probably familiar with Tim Jackson (aka Masiguy). Tim is not only the brand manager over at Masi but an excellent writer and a true lover of all things cycling. 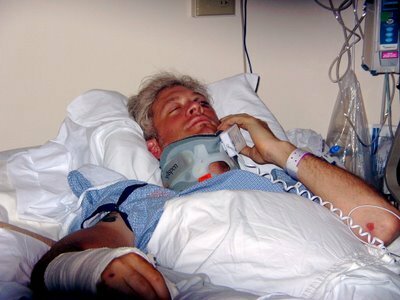 Tim had a nasty fall on Tuesday while riding at the San Diego Velodrome and banged himself up pretty badly. This photo was shamelessly stolen from Kathleen's blog. Kathleen visited Tim at the hospital this week and anyone who wants to get a better update on Tim's condition should visit her place as she has an excellent post about how he's doing. Thanks Kathleen for the updates and when you see Tim again please send my best wishes and my heartiest hopes for his speedy recovery. I hope that everyone here will also send happy thought Tim's way.